While preparing for my Italian dinner party, I realized that we spent a ton of time cleaning the apartment before Dan’s parents came over. Why? Because with two full-time jobs, staggered work hours, and a long commute, something has to give. It’s cleaning. It’s not that we live in a pigsty, it’s that time gets away from us in doing the more time consuming cleaning – dusting, mopping all the floors, cleaning out the fridge, etc. I realized we were only doing these things before we had people over to the apartment. Then, we have a marathon cleaning session which leaves us not wanting to do that again for a long time. This one’s generic, and can be used by anyone as a starting point. My actual cleaning schedule contains tasks related to Phoebe (walks, vet visits, grooming, etc. ), but since not everyone has a Phoebe, I left those off of this list. I tried to include cleaning that doesn’t usually get done, but really should. For example, when is the last time you cleaned your doorknobs or wiped down your remote with a Lysol wipe? Most likely never. Think of the germs that live on there! Gross. 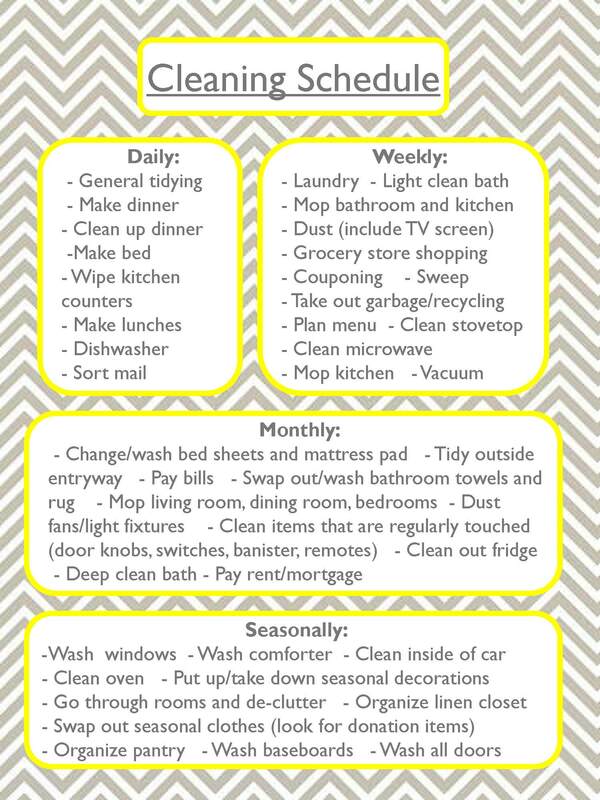 I think that by writing down all the tasks to be done, the cleaning is more likely to happen. Of course, this is yet to be seen, as we’re just starting to try out this method. Hopefully, it will work and I’ll have a very clean apartment.